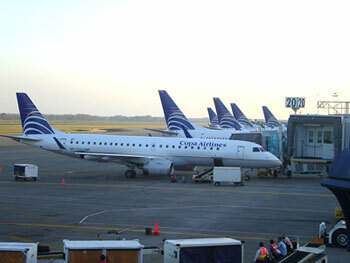 Copa Airlines is the national airline carrier of Panama in Central America. The airline company was estalished in 1944 by parent company, Copa Holdings, S.A. and with headquarters located at Panama City, Panama. 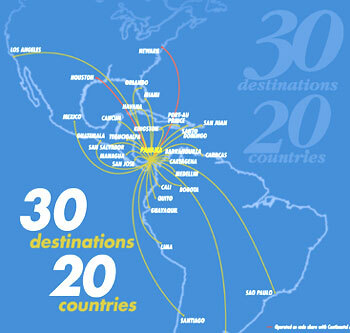 Copa Airlines operates scheduled domestic and international flight destinations from its primary hub in Tocumen International Airport. With a total fleet size of 37 aircraft, Copa Airlines flis to over 40 destinations in 21 countris, having 116 daily flights each day. The destination cities covers throughout North America, Central America, South America and The Caribbean. The frequent flyer program for Copa Airlines is the OnePass. This program is through partnership with Continental Airlines which offers frequent travelers to be rewarded with either free tickets, First Class upgrades on flights or special discounted membership for usage of its airport lounge (President's Club). There are also other types of rewards available. The Presidents Club is the name referring to the membership airport lounge program which operates in conjunction with Continental Airlines. This lounge is located at Tocumen International Airport, Panama City, Panama.